How Many Baby Teeth Do Kids Have? It’s always an awe-inspiring time of your life to see your child develop teeth as well as see the changes your little one is going through while seeing how many baby teeth fall out. Nothing fulfills your life more than dressing up as the tooth fairy and seeing your kid’s gaping smile as he shows a quarter at the breakfast table. But there are some common questions you have while embarking on this journey? Like, what kind of teeth does my kid have and what kind of teeth they have? When is it normal for teeth to fall out? And, how many teeth does my child have? But don’t worry, we are here to save the tooth fairy from any concerns. We’ll start first by going over the different stages your kid’s teeth will go through, how many baby teeth your child has and what they will have in the future. It can be difficult not knowing how many baby teeth your child has. It’s also extremely important to Know the difference between a baby and adult tooth and when they fall out. After all, you don’t want your child sporting an eye-catching smile without any front teeth! There are over 3 different sizes of teeth, I hope you haven’t fainted yet. The first type of teeth your child is born with are called milk teeth, or baby teeth and a full set contains 20 healthy teeth. Most children don’t grow these teeth until they are half a year to a year old. The average age for baby teeth to fall out is 6-7 years old. In comes the adult teeth. These teeth push out the baby teeth and start growing at 12 to 14 years old. An average person grows 32 adult teeth, but it doesn’t stop there, in comes the trickiest teeth. The next and final set of teeth are called wisdom teeth. The teeth come in a set of 4 and come in when your child is around the age of 6 to 22. Unfortunately, these teeth mostly require surgery to be removed since they don’t come in properly 3 out of the 4 times. How Many Teeth do Children Have and When do They Fall Out? So how many baby teeth do children have? You can consult a Primary Teeth Development Chart on WebMD. 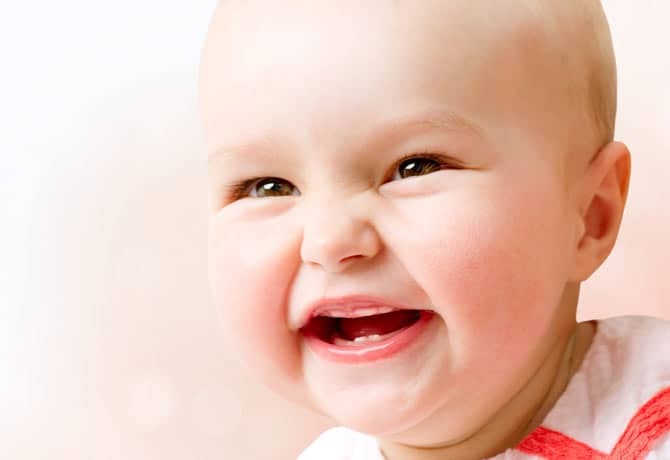 Children are born with 20 healthy baby teeth which usually fall out at age 6-12. Next, adult teeth, come in a set of 32 (nearly 1.5 times the amount of baby teeth). Lastly, wisdom teeth, come in an equal set of 4 and usually come in at age 14 and fall out depending on when surgery is planned for their removal. Since the majority of the time, they come in crooked and can cause serious dental problems. One of the least enjoyable trips of your life is going to be their first trip to the dentist. It will be full of pouting, crying, and shouting but it will be instrumental to their well-being. Try to bring your child to the dentist after their first birthday. During the visit, the dentist will do a routine cleaning including teaching you a few brushing skills for your knowledge, as well as discussing how many baby teeth your child has at the time and how many they will continue growing. Remember, February 1 is the nation’s Give Kids a Smile Day, where dentists volunteer from their jobs to give kids cleanings to help prevent early dental disease. Did you know that dental disease affects 25% or more of American children yearly? Every year GKASD treats over 400,000 children giving them a brighter and healthier smile. Getting your children a good start on their dental hygiene paves a path to growing into a strong and healthy adult. The most important decision you can make is…disposable brush or electric? It is literally that hard. Do I spend $5 for a disposable or do I do the extra mile and buy a $20 electric brush. Believe it or not, it doesn’t matter. The most important decision you can make is how a brush will affect your child’s teeth. You have to deal with factors with size, bristle variety, and what your doctor might recommend. If your child has more sensitive teeth, especially right after a cleaning, you want to go with a toothbrush with softer bristles. Another big concern is thumbsucking. Due to this, your child’s teeth may come in crooked which can lead to braces to help realign them. The best way to counter this is to speak to your dentist for professional help or consult your child’s pediatrician. After reading up on the article, we hope we helped out lower some stress on the tooth fairy and some learning on how many baby teeth children have. Teeth are a hard hurdle in your child’s life. But, if you stick to a good brushing schedule and follow your dentist’s directions to the dot, you have nothing to fear. And if you have any questions we couldn’t answer consulting your local doctor is your next best bet. Happy brushing! Copyright © 2014 - 2018. All rights reserved Health Row.